The Motion Control S1A3 Bundle B0 from iFootage enables you to add motion control when using your camera on a Shark Slider S1 (not included). 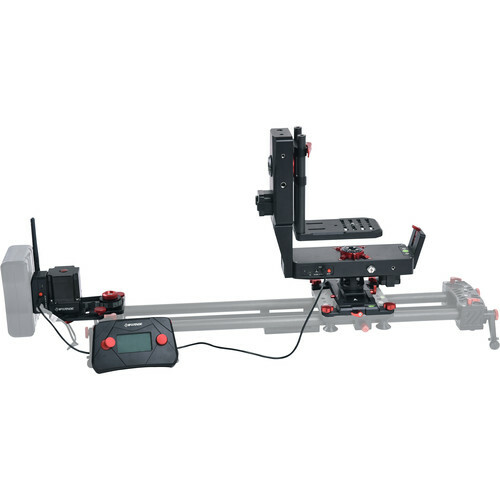 This kit contains the iFootage S1A1 motorized slider-carriage system, and the Motion X2 camera motion control bundle. Together, these components enable you to program precise movements suitable for time-lapse and panoramic shots, as well as standard filming. The Motion Control S1A3 Bundle B0 includes two wireless controllers with camera shutter, slider carriage position, and pan/tilt functions. Movements can be saved to nine tracks for playback; the system can also operate in manual mode for on the fly shooting. The Motion Control S1A3 Bundle B0 is compatible with the Autopano panoramic software (not included). This system can support DSLRs or camcorders weighing up to 17.6 lb. The Motion Control S1A3 Bundle B0 can capture 360° images with the two-axis head, capable of up to 360° of pan and 90° of tilt. The time-lapse function includes settings for the number of frames as well as the length of time between stills. Basic parallax adjustments can be made with the Motion Control S1A3 Bundle B0. Two hard-shell carrying cases are included in this bundle. Box Dimensions (LxWxH) 20.5 x 18.0 x 6.0"